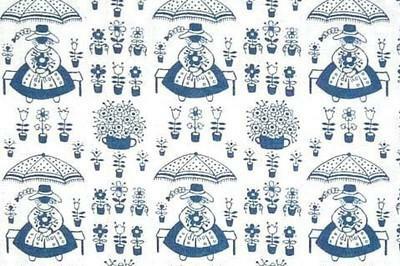 These German fabrics are really lovely in their two tones .. this one being - white and dark blue. The width of these bolts is 58 inches which is great for larger projects, a bonus. Very pretty with a lady sitting on a park bence holding a flower and then there is an umbrella over her head and potted plants dotted around her .. scale size the height of the lady is 3.5 cm.